Do you know what’s lurking in your medicine box? Every year, big pharma rolls out a whole new set of OTC meds or non-prescription drugs designed to treat everything from headaches to indigestion. And since, these are available at relatively cheap costs and of course are easily accessible as well, we hardly stop to think twice before popping a pain pill. Headache- have a painkiller; allergy- have an antihistamine; constipation- have a laxative. No matter what the issue, we have a pill for everything! But are you aware that long term use of OTC drugs can have serious effects on your body? Many OTC drugs, especially the ones for cold and allergies are actually concoctions of several medications. And, they are best fit for treating symptoms of short-term illnesses. Regular, long-term usage can cause serious health issues. For instance, Ibuprofen can damage the stomach lining and lead to blood loss, gastritis, and ulcers. Worse, combining two drugs, like aspirin and ibuprofen can increase the risk by several fold. OTC drugs can also interact in harmful ways with other prescription meds. For instance, aspirin is not advisable for use with other blood thinners, NSAIDs (non-steroidal anti-inflammatory drugs), and antibiotics. Cold and cough medicine is not good to combine with anti-depressants. And, so are NSAIDs, which can reduce the effectiveness of anti-depressants. 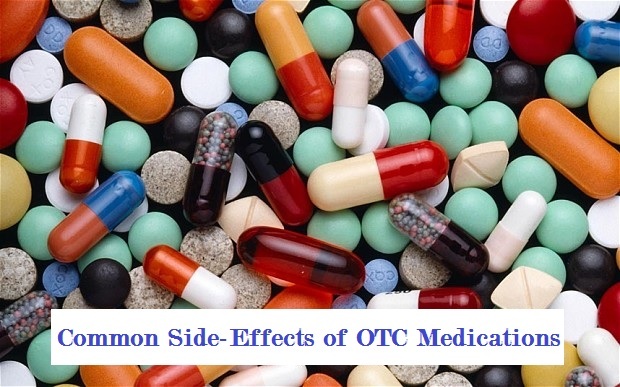 Here are a few ways to avoid the adverse effects caused by OTC meds. Limit your usage of OTC drugs- don’t use them until you really need them. If you’re on prescription meds, always consult your doctor before taking any OTC meds. Always read labels to know what the medicine contains, and check for warnings and common side effects. Take the medicine within its recommended dosage level. Always use a measuring device when you give medicines to children. Don’t mix up the medicine in food or take a capsule apart. Interaction with atmospheric elements or food may change the way a medicine works. Don’t mix it into hot drinks either. Never down any medicine with alcohol. Don’t take your daily vitamins along with OTC drugs. They can cause problems when taken together. Always keep track of your reaction to a medicine, even if you didn’t have a reaction to it in the past. Avoid taking medicines containing the same active ingredients at the same time. OTC medications are mostly safe when used properly, which is obviously why you don’t need a prescription to buy them. But long term usage, overuse, and overdose can cause serious side effects and even death in the worst cases. It is therefore advisable to stay informed, read, and follow dosage instructions at all times.